Corn tortillas are filled with a luxurious and creamy chicken mixture, then doused with a tart and smoky tomatillo sauce and topped with a generous handful of gooey cheese. 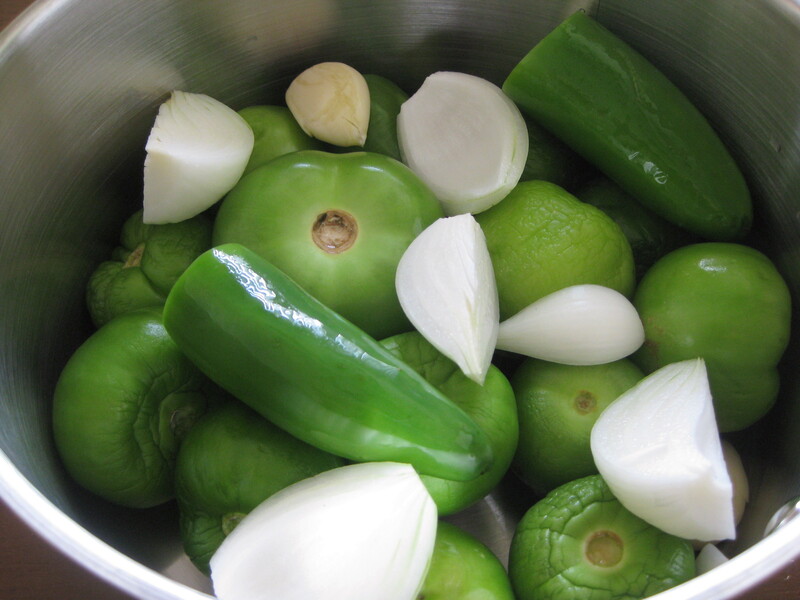 Put the tomatillos, jalapenos, 2 garlic cloves, and onion in a saucepan with water to cover. Bring to a boil, reduce the heat and poach until the tomatillos are soft, about 10 minutes. Drain. Put the vegetables in the blender, add 1 teaspoon cumin, and puree. Add the cilantro, lime juice, and salt, and pulse to combine. Set aside. Meanwhile, place the poblanos on a baking sheet and broil, turning with tongs, until the skin is blackened. Skin the peppers; then seed, core, and dice them. Heat the olive oil and butter in a large skillet over medium heat. Add the onion and cook until soft, about 5 to 7 minutes. Add the garlic and cook about 1 minute. Stir in the cumin and cook another minute. Then sprinkle on the flour and cook, stirring, yet another minute. Gradually pour in the stock, stirring constantly. Bring to a simmer, stirring to make sure the flour doesn’t stick to the bottom of the pan; the liquid will thicken. 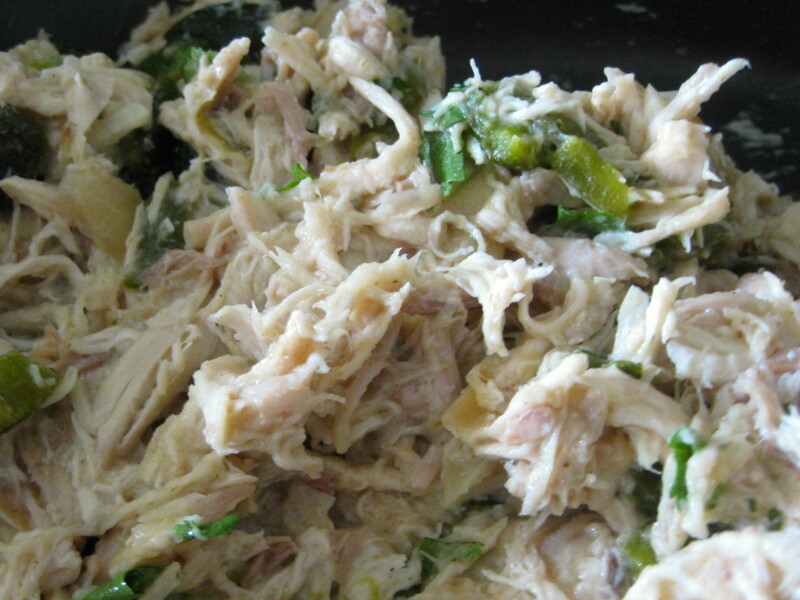 Fold in the chicken, diced peppers, and cilantro, and season well with salt and pepper. Preheat the oven to 350 degrees F. Pour most of the salsa into a pie pan, and set out two 9 x 13 baking dishes. 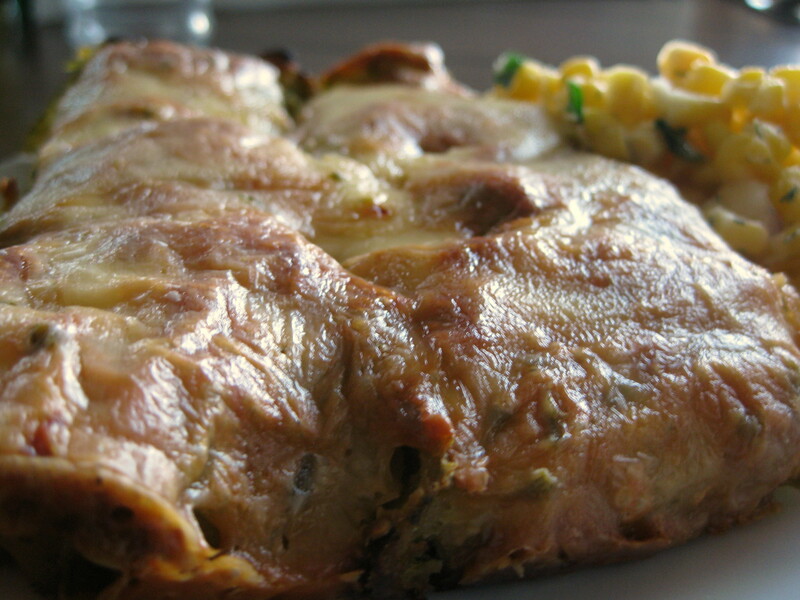 Dip a tortilla into the tomatillo salsa, place a large spoonful of the chicken mixture in the center, sprinkle with a little cheese, and roll the tortilla like a cigar to enclose the filling. Place it seam-side down in one of the baking dishes. Continue to fill all of the tortillas and put them in the baking dishes. Pour the remaining tomatillo salsa over the top and sprinkle with the remaining cheese. 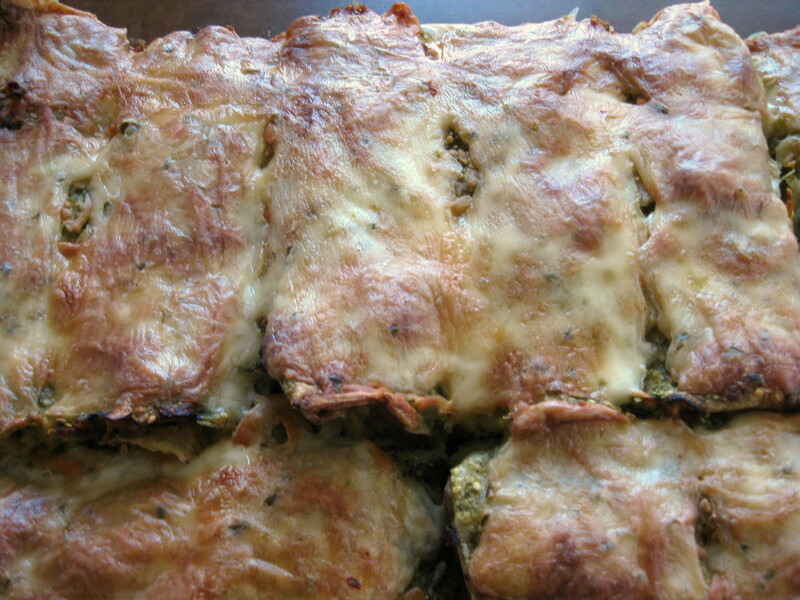 Bake the enchiladas uncovered for about 30 minutes until bubbly and cracked on top.